The ethnography takes the form of an interview conducted at the house of ‘Baale Sango’ popularly known as ‘Baale’. He says he is the chief priest of all worshipers of ‘Sango’, a deified king of the old Oyo Empire. Sango is now worshiped as the god of thunder. Baale Sango designs and sews costumes worn by masqueraders during the ‘Egungun’ festivals. This is known as ‘eku eegun’ in Yoruba Language. My mates and I arrive at Baale’s house around 10:30 am on Tuesday 21st May, 2013. The residence is a typical ancient Ibadan duplex, built with mud but plastered with cement. After a few moments of waiting (because he is not at home), he arrives wearing ‘ankara’ fabric clothes. We exchange greetings, introduce ourselves as students from the University of Ibadan and tell him why are at his house. He welcomes us and leads us into an average sized room where the costumes are made. In the room, there is a large table in front of one of the windows. There are two windows in the room but only the one facing the table is open. Apart from the table, there are other furniture items like a bench, stools and shelf in the room. On the table, there are piles of clothes of different fabrics and colours (red, yellow, gold, silver, and some shiny fabric). There are also a number of wooden carvings (the form of a man’s head), thread and scissors on the table. There are also piles of clothes on the bench and shelf which are on the left side of the door. Empty containers of gin and schnapps litter the floor. There are two sewing machines in the room; both near the table on the right side of the door. Other noticeable items are the small earthen pots that that are tied to the door post. There are calendars on the wall, tree barks in various corners of the room and an egg in a tray in the far corner on the left. One of the wood carvings is deep brown and glossy (unlike the other one that looks dry). When we ask Baale, he says the wet carving has been soaked in 21 different herbs for eight days and now it has spiritual efficacy. He says the carving can now be worshipped as a god and sacrifices can be made to it. It is only the ‘Baale’ we meet at the workshop but after a while, another man joins us. He’s an ‘Ifa’ (divination) priest and he also joins in answering our questions. When asked on how many years he has been in business, he says he has been involved for about fifty years. He says he was born into the trade and his father introduced him to the art at an early age. So rather than go to school, he has been with his father learning the art. He says that although no family is known peculiarly for sewing costumes, his family has been in the business for as long as he can remember. His grandfather was a masquerader and the masquerade ‘Olukoyi’ was passed down from previous generations. When asked about the state of things pertaining to how well the next generation is receiving the art, he says he is not keen on making his sons take up the trade. He however adds that his sons know about it and they assist him once in a while. They sometimes go outside to get jobs but he is not keen on making them take over the business from him. He has a son at the Polytechnic who is also involved in local politics but still engages in the art. When the time comes for the ‘egungun’ festival, the young man would design his own costume, sew it and go out for his performance. ‘Baale’ feels bitter about how the younger generation uses masquerades to perpetrate evil and violence. He says as much as he would have loved continuity, the younger generation does not truly understand the essence of masquerading. He mentions the different types of masquerade as ‘Alagangan’, ‘Alabala’, ‘Apidan’, etc depending on their purpose. Concerning the rituals that should be done for the ‘Egungun’ festivals, he says the festivals usually begin in the sixth month of the year and that is around when the rituals also start. Solid pap, bean cakes, and ‘moi-moi’ (beans ground with pepper, wrapped in leaves and left to steam in a pot) are prepared and distributed for people to eat. Then the blood of a rooster will be sprinkled on the staff (isan eegun) of the masquerade. This is to renew the spiritual efficacy of the staff. The staff itself can be used to settle disputes among people and can be used to catch liars. The ‘isan’ is a bunch of sticks of the same length tied together. ‘Baale’ says that there are nine different species of trees there and a bunch can be used for up to twenty years before it becomes obsolete. The caveat is that it must not be used to hit a person because the consequences are grave. He says business is at its peak during the festival. At that time, apprentices come around to work for daily pay and his sons also assist. They usually drink gin or schnapps before work is started because of the hectic nature of the job. There are times that the workers or assistants may be required to wear the costumes themselves especially when the design requires it to be sewn upright or when finishing touches are to be done. Some of these apprentices are also masqueraders and they come around to assist in designing costumes. He further explains the usefulness of the masquerade, saying that they serve as dispellers of diseases. As they walk or dance through the streets, they wipe diseases off the streets. Epidemics like cholera, chicken pox, small pox and all kinds of fever are expelled. The Ifa priest also contributes by saying that the ‘Egungun’ has a way of contributing to the general wellbeing of the state. It has a way of bringing both spiritual and environmental peace to a town, city or state. And it is good that the government and the people are giving the necessary support. The ‘Ifa’ priest says that ‘Egungun’ is an indispensable part of our culture. He recounts the story of a masquerader who converted into another religion and got blind while praying. It was when he wore his costume again that his sight was restored. He says that there are other stories like that of families who have suffered losses because they abandoned their masquerades. After the questions, ‘Baale Sango’ takes us into another room where he keeps his own masquerade costume and the already completed jobs. We are asked to remove our shoes as we enter and I took the extra pain of entering left foot first (call it superstition). This room is not as well lit as the previous one. It is also an average sized room with a clothes line in the middle of the room on which used costumes are hung. 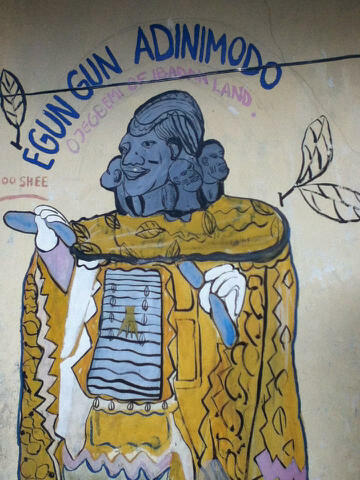 In the far right corner is the costume of Baale’s masquerade- Eegun Adinimodo or Eegun Olukoyi. It has a large wood carving on top. It is the carving of a man’s head, with about four other heads around the neck. There are layers of fabrics of different types stemming from the head. These fabrics also have different colours. He then shows us some other costumes belonging to other masqueraders. Finally, a little gift is presented to him (schnapps), prayers are said and we leave. WritiVision: Affecting the world one page at a time. Poetry, Prose, flash fiction, opinion, et cetera. Basically, this is where thoughts are worn on sleeves, and where creativity lives. "We Tell Pictures, We Snap Stories, We Question Answers"